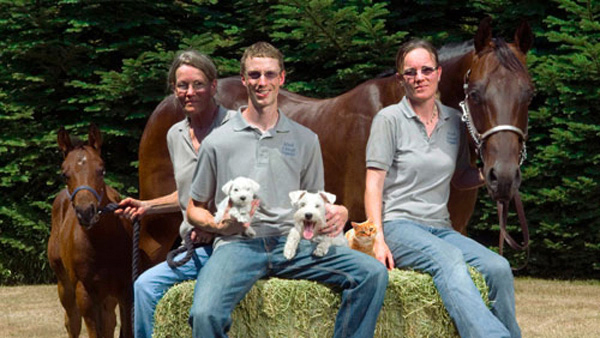 Mad About Organics started in 2007 when Sue and Elana decided to breed Sue's prized mare - Christy. Elana, having a Master's Degree from Oregon State University in Equine Genetics and her mother Sue, having a background in the medical field as a retired nurse, set about a course to eliminate the use of fly sprays filled with chemicals on their horses. Elana and Sue began extensive research into 100% organic essential oils containing no pyrethroids because of their detrimental negative effects they can have on animals and us. With much time spent, trial and error and a little luck from the gods, they did it! Elana and Sue developed our successful 100% Organic Herbal Insect Relief Spray. This made a huge difference in our horses' lives and in our lives as well. Once the horse fly spray had been developed we found ourselves turning towards our dogs and cats and started developing our own flea and tick formulas. Our flea and tick topical treatment for dogs and cats has been our biggest success story to date. Our mission is to take a different approach to protect animals from insects organically, eliminating the traditional toxic chemical treatments that can cause major issues. Since we have many animals ourselves we deal with many different issues, resulting in more and more products being developed. Like you, we only want the best for our animals and have now developed a whole line of products consisting of: Flea and Tick products for dogs, cats and small animals, Advanced Dental Care (Organic Herbal Oral Gel, Organic Plaque Remover Dental/Digestion Food Additive and Organic Liquid Plaque & Tartar Water Additive), Healing Skin/Itch Relief, truly one of a kind Shampoos, Organic Healing Ear Cleaner, Organic Healing Salve and our amazing Healing Liniment. Our goal at Mad About Organics is to be known as the company that provides the Safest, Most Natural and Effective products for you and the ones you love. It is also a goal to treat others as we would want to be treated ourselves. It's a sad fact that many companies lose this vision and the customer is the one that takes the hit. We loving hearing from our customers especially when we know our products will help the situation. Thank you for taking the time to learn more about us and we hope now that you trust what we are setting out to do and you become a fan for life.